When crocheting with two or more colors, you often carry the yarn that you’re not working with at the moment. (You carry the yarn until you need it again.) Carrying the yarn means that you don’t have to fasten it off and rejoin a new strand each time you make a color change. Carrying on the wrong side: Carrying the yarn across the row on the wrong side of the fabric is probably the easiest method to use when working with different colors. 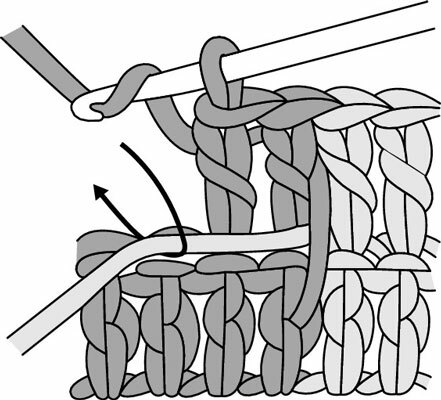 To carry a strand on the wrong side of the fabric, work over the strand every few stitches with the second color. Working over the strand: Working over the carried strand produces a neat appearance on the wrong side of the fabric, which is especially important on a design where the backside is visible, such as an Afghan or a scarf. Lay the unused strand of yarn across the tops of the stitches of the previous row. Then, using the new color, work the stitches in the current row and encase the strand. 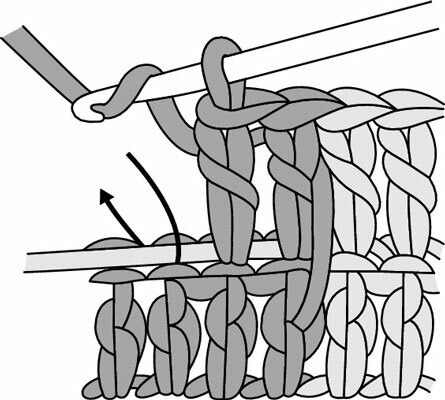 Carrying on the right side: The only reason you ever carry the yarn on the right side is if the carried strand is an integral part of your design. You may want to catch the strand every other stitch or even every stitch, depending on the pattern, to make sure that no long, loose loops are hanging around. Carrying up the side: Carrying the yarn up the side comes in handy when you’re working a horizontal stripe pattern. However, this technique works only when you’re crocheting stripes in even numbers of rows. If you’re working a stripe pattern that changes color every row, the carried yarn won’t be on the side you need it to be when you want to pick it up in the next row. Keeping colored yarns in order: If you’re carrying several different colors, you can end up with a tangled mess in no time at all. For small areas of color, cutting off a few yards of the required color and winding it around a bobbin alleviates this mess. 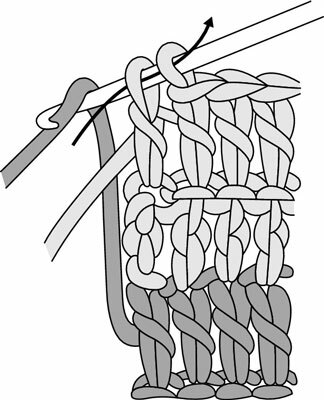 Leave the whole skein intact for the most prominent colors, however. When to carry the yarn: If you’ll be switching back to the carried yarn color several times across the row, then carry the yarn all the way across. If the design is only in a particular section of the work, then carry the yarn only in the part of the row where the design is featured and then let it drop while you finish the row. Making carried yarn just tight enough: Keep the carried strand of yarn tight enough so that it lies flat against the wrong side of the fabric and doesn’t catch on anything, but don’t pull the strand too taut, or the fabric can pucker. Letting carried yarn show through: The carried color is sometimes slightly visible, depending on the type and color of the yarn and the stitches you’re using. But don’t worry because, more often than not, this visibility adds depth and contrast to the design.